First off…thanks mom! And why didn’t you tell me how insanely easy making this chicken that everyone loves really is? I’m serious people. So easy. Chicken. Marinate in soy sauce or teriyaki sauce (one or the other, not both), grated ginger, and chopped green onions for half hour or more. Cook at 375 for 45 minutes, flip and cook for 15 minutes. Serve over rice. Done. Oh my goodness. Now I do have to admit that I think next time I’ll use teriyaki sauce instead of soy sauce. After a few drumsticks, the saltiness got a little on the intense side. But still, this reminded me of home. 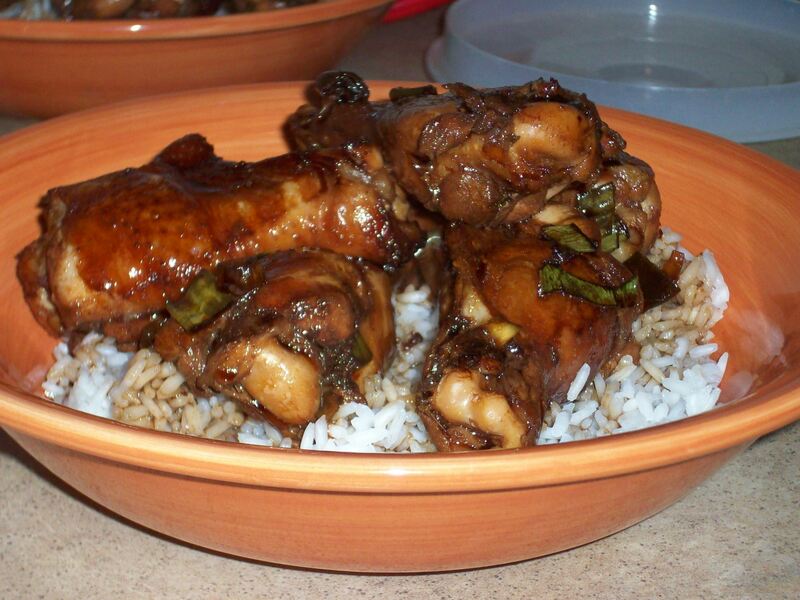 And goodness knows I will always miss mom’s cooking, no matter how hard I try to recreate it. So I managed to get away with not working a double tonight…which meant I could finally cook in my kitchen again! For the first time in probably almost two weeks. It was a good feeling. I knew the roomie was going to the store, so I had her pick up a couple things and pull out the pork chops before I got home. And life was good. 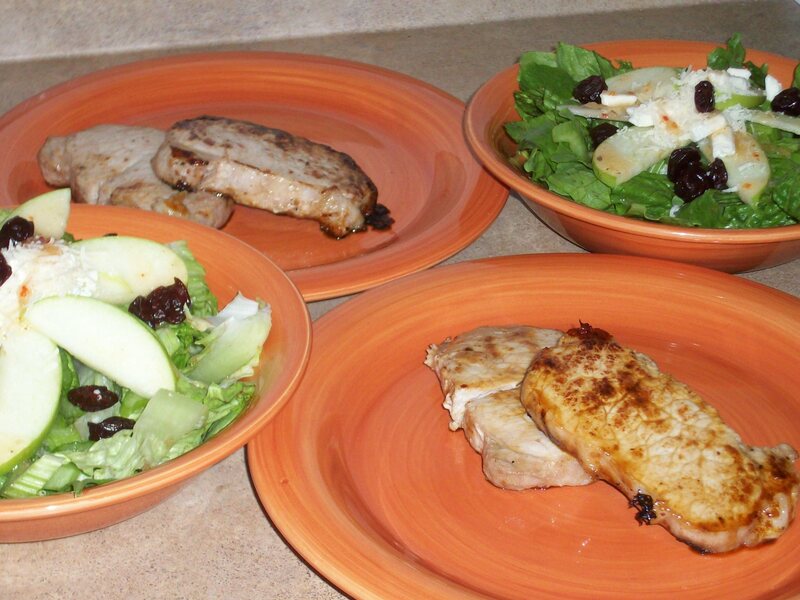 So the menu tonight was garlic balsamic pork chops and a mixed greens salad. 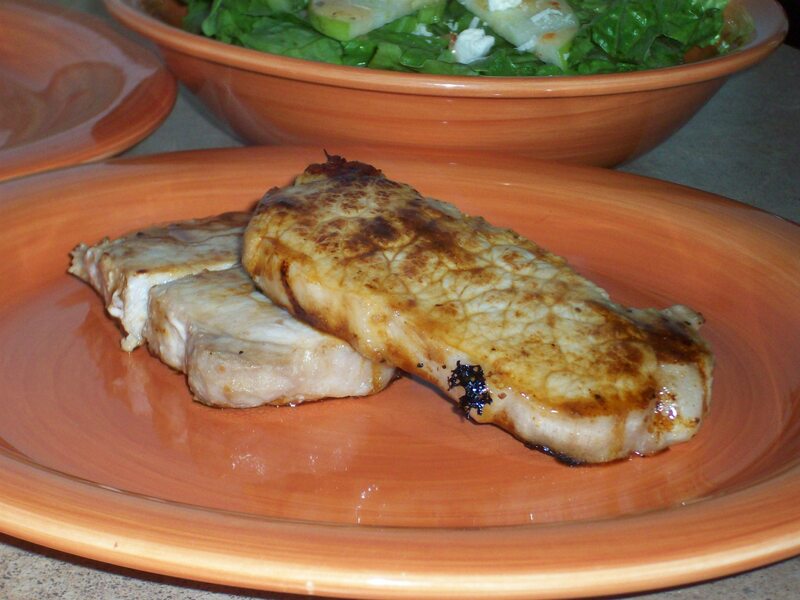 I took a little help from the store by using a bottled marinade, but oh my goodness was it tasty (thanks mom!). And the pork wasn’t overcooked, it was just perfect and juicy. I wish that there was some way to capture and upload a smell…because this apartment smelled amazing. For the salad, I made up some candied pecans – from scratch! I actually picked the brain of the head chef at work to figure out how to do it. But then, go figure, I forgot to actually put them on the salad. That’s what I get for not pulling them out of the fridge with the rest of the ingredients. 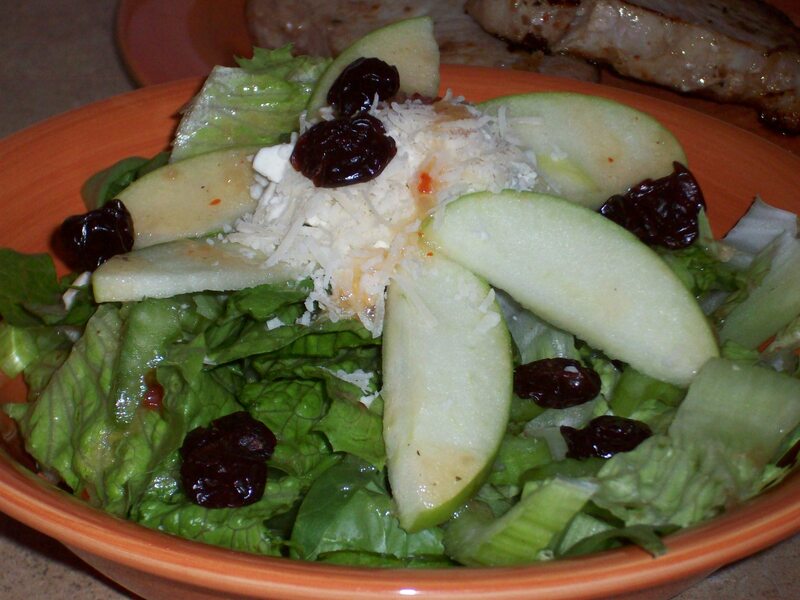 But the salad was a mix of fresh baby spinach, freshly chopped romaine – not that bagged stuff, this was so much more crisp and pretty – celery, sliced apples, dried cherries, feta cheese, and Parmesan. Topped lightly with Italian dressing. The chefs at work make a really tasty apple cider vinaigrette to go over ours…but I wasn’t in the mood to attempt that. While I was making the pecans, I also decided to make some granola to go with my yogurt in the mornings. That was so stinking simple! I added in some coconut with some walnuts and oats. I think when I actually put it on my yogurt, I’ll probably throw in some fresh fruit too. Some of those dried cherries would probably be pretty tasty. So for dinner the other night I wanted to make something simple and not time consuming. We’ve had hamburger helper in our cabinet for goodness knows how long…so voila! The dinner problem was solved. But anyone who knows me knows that I cannot just make something the way that the box says to. So my four-cheese lasagna hamburger helper turned into a dish more Italian, and of course more cheesy. Instead of just grilling up the hamburger solo, I added in garlic and chopped green onions. And then I threw in some more Italian seasoning, the pre-mixed kind, and topped the whole thing off with some Monterrey-jack cheese. My roomie actually taught me something about making this stuff out of a box too! She told me that if you don’t drain the hamburger – because a lot of the flavor lies in the juices that cook off – to just add 1 cup instead of 1 1/4 cups of water, and it won’t become a soup. Awesome! I was recently browsing the web for more cooking and eating blog and stumbled onto quite a few that I am now in love with. (See the “What I’m Reading” linkset at the left side of the page.) 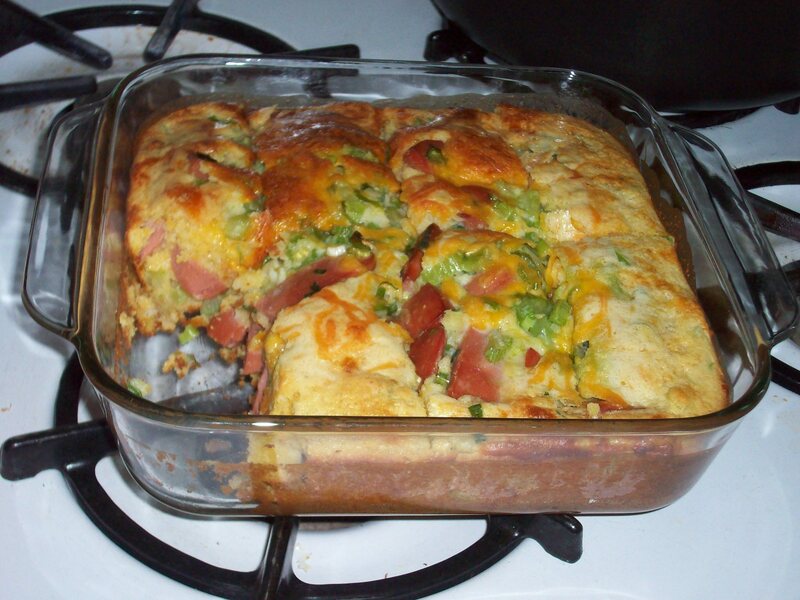 This recipe came from You Are What You Eat…or Reheat, from a set that she does called White Trash Wednesdays. Well anyone that knows me well knows my affinity for corn dogs…and this seemed right up my alley. Of course, I enlisted my trusty guinea pigs (the roomie and the cooking friend) to be my taste testers, and they both had multiple helpings, as did I. So I must have done something right. Given, the whole flavor combo was a bit strange…but surprisingly tasty. And in corn dog fashion, I had to top it with mustard. I think this recipe has some potential to be recreated in different ways, but could be a family favorite just the way it is. My goal was to make home made macaroni and cheese. I’ve never done it before. But me and the roomie being the cheese-hounds that we are, I couldn’t just make it with cheddar and call it a day. That defeats the purpose entirely. About the same time that I decided I wanted to do this, shredded cheese was on sale at the grocery store. Fantastic! So I picked up about 8 different kinds, along with two block cheeses, to accompany the other kind I had in the fridge, and some small custard cups. That way, I could make individual portions with different mixes. This is gonna be fun. I found a recipe that called for a mixture of evaporated milk, sour cream, eggs and seasoning, and then I could play the layering game of macaroni, cheese, sauce…so on and so forth. This made it really easy to make individual portions. Then once it was baked, we just pulled out the portions and sat down to try them all. I kept a pen and paper near by so I could make notes on what we thought about each of them. The decision: All of our mixtures needed some garlic, and some of them needed some other seasonings or meat. The favorites? It came down to the havarti, bleu and muenster, and the feta, cheddar and pepperjack. Though with both, we decided that if using a chunky cheese like bleu or feta, it needs to be melted down into a cheese sauce first. Havarti and cheddar – classic taste, would be good with mild Italian sausage. Havarti, bleu and muenster – needs to be melted, the bleu is too overpowering when just crumbled. Mozzarella and bleu – not creamy at all, needs Italian seasonings to compliment the mozzarella. Colby jack and muenster – kind of boring…no burst of flavor. Would be good with ground beef though and some spice. Feta, cheddar and pepperjack – needs a sneaky spice, like cayenne, and needs to be melted down. The feta amps up the flavor from just plain cheddar and pepperjack, making it a unique choice. Mozzarella and cheddar – though good on a pizza, it only got two bites. Not really a point with pasta, too bland. So having made the trip home for the Independence Day weekend, of course I got home cooked yumminess. Its one of my favorite parts of being home, because no matter how hard I try, I can’t ever recreate mom’s cooking. But this time, the yumminess was in new forms! Mom decided I was going to be her guinea pig on some new recipes she wanted to try, because she knows that I will try about anything when it comes to food. On the first night, she made these ground turkey, rice and pinto bean burgers. She said she added in coriander seeds and some cayenne pepper (in substitution for chili powder that she didn’t have). We decided that next time she makes these – or if I do – that we need to use ground coriander. Did you know that coriander seeds bite back when you bite down on them? Oi! We put these burgers on whole wheat buns, with a creamy avocado mixture – almost like a guacamole, but not quite as chunky. A little bit of red lettuce and voila! Tasty. On night two, she made something I had heard of, but that she hadn’t had in years, and I plain had never had. A Spanish dish, Paella. Rice that is cooked with saffron ($16.99 a bottle! ), mixes in with frozen peas, shrimp, spanish chorizo (though we used smoked sausage because the chorizo wasn’t readily available) and mussels…I was pleasantly surprised. I’m pretty sure there are some other ingredients in there, but I wasn’t home when she was making it, so I couldn’t tell you what they were. If you’re ever in the mood for spanish cooking, try that.